Science, by any means necessary: Controlling the brain, with lasers! 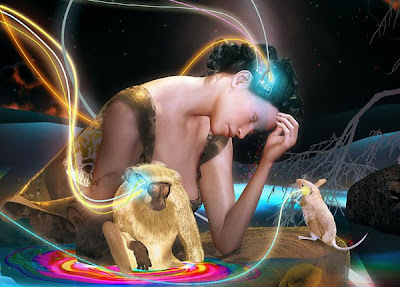 Controlling the brain, with lasers! It's about time I started talking about what I actually work on! I'll have much more to say (and sing!) about my own specific projects later... but for today I'll just briefly highlight one of the most exciting techniques our lab uses: optogenetics. My neuroscience friends are already well-acquainted with this super-hot new technique. But for the uninitiated, allow me to introduce you to biology's latest & greatest fad! First, check out this recent news story featuring our lab! In Lex's study, he and his co-workers targeted the gene for a light-sensitive protein to specific sets of neurons in mice, which allowed them to activate those specific cells using a fiberoptic inserted into the brain. The neurons they targeted are located in a major motor control circuit of the brain called the basal ganglia. Within this circuit there are two main pathways -- one that stimulates movement and one that inhibits movement. In an elegant set of experiments, Lex and his colleagues demonstrated that by targeting one pathway or the other, they could cause the mice to run around or to freeze in place simply by turning on the laser. They then applied this technique to Parkinsonian mice and showed that activating the pro-motor pathway restores their movement to the level of normal, healthy mice. And remember, all of this behavior was controlled entirely with lasers. If you go to the online version of this paper, you can watch cool videos of the mice responding to the light. Why is it so super-hot? The results of this study are exciting, but why is optogenetics SO hot right now? The main answer lies in its specificity. In the past, fast control of neuronal activity was achieved almost exclusively with electrodes. This was done for brain cells in every type of situation -- in the laboratory dish, in animals, and even in humans (for example, deep brain simulation for Parkinson's patients). The problem with sticking an electrode in the brain and zapping it with electricity is the lack of specificity. You're zapping EVERYTHING in that region. But the brain is a complicated structure, and even one tiny area can contain many different types of cells, with diverse and often opposing functions. An electrode will affect all of those cells and there's nothing you can really do about that. In contrast, flashing light onto a brain area does absolutely nothing EXCEPT in the cells that you've specifically targeted to express a light-sentive protein. Current methods for attaining specificity of expression are usually a mix of genetic techniques and site-specific injections into the brain. Now it's possible for researchers to see exactly what certain types of neurons do. No more confounding effects of other intermingled cell populations. A variety of light-sensitive proteins have become available that can activate or silence neurons or even change signaling molecules within the cell. Optogenetics is not a panacea for every experimental difficulty in neuroscience, but I don't think I'm overstating if I say that it's revolutionizing the field. Within only a few years after development, optogenetic tools are quickly reaching labs everywhere and are being applied to countless areas of neuroscience research. Scientists have been able to address previously-unanswered questions about depression, learning & memory, sleep, perception, and much more. The techniques of optogenetics truly go with everything. Lex's publication dealt specifically with Parkinson's disease, but the brain areas our lab studies are also involved in other movement disorders as well as Tourette's syndrome, obsessive compulsive disorder, schizophrenia, and addiction. Using light to precisely alter the activity of specific neurons in the brain not only increases our understanding of how the brain works but also opens doors for new therapeutic strategies in tackling diseases. The fervor for optogenetics in neuroscience right now is pretty intense. The novelty and hype surrounding these techniques has sometimes been a quick ticket into high-impact journals. However, the field is quickly adapting and must soon reach a point where studies using optogenetics are appreciated purely for the quality of the science and importance of the questions that are addressed. So yes, in time the hype and glitz of optogenetics will fade. But it's clear that this trend is here to stay. So cool! Thanks for sharing, Robyn! I can definitely see how this technology could be positive in countering unpleasant occurrences in human development, but it is scary at the same time. Unfortunately, such powerful control of the human brain will not be limited only to ethical, well-meaning scientists; it will undoubtedly eventually make its way into the hands of opportunists who will only care about financially exploiting the technology or ways of turning humans into their own personal bidders. Hi Robyn I am a student from Hampshire College and I'm writing a blog post on Optogenetics. I find your "How Optogenetics Work" diagram very illustrative and I'm wondering if I can use it on my blog. I am just using it to explain the basic idea of optogenetics. If you have any questions please don't hesitate to contact me thru xw13@hampshire.edu. Thank you very much! Hi, I'm a student from Duke University and like Elaine, I'd like to use your "How optogenetics work" diagram for an article on optogenetics for the Duke Science Review journal. I would give full credit to you for the diagram, and am hoping to get your permission. If you have any questions, please contact fshen11@gmail.com. Thanks! Forgot to tick the notify me box re requesting that you email me your ok for using your diagram info in our film..have checked the box here so you will be able to contact me.. this is urgent..thanks..
Hi Robyn, I work for an educational charity and I'm currently putting together an online resource on how biochemists use light in different ways to help them investigate the world around us. 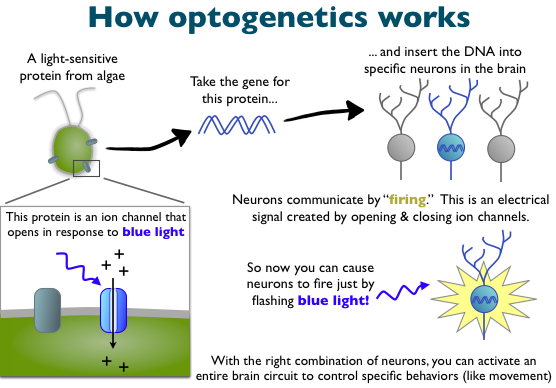 The image explaining optogenetics is brilliant and I was hoping you could give us permission to use it in our booklet. We will of course credit you as the author in whatever fashion you prefer. I am writing from Dorling Kindersley. We are a part of the Penguin Random House group. We are currently working on the revised edition of one of our existing titles called "The Brain Book". To illustrate the text on one of the spreads we would like to use the attached image of the The Process of Optogenetics. We found the image on the following link and are really keen on using it in our book. We would require hi resolution image at print quality 300dpi. By agreeing to let us use these images again we understand we have your consent to use these images in all editions in all forms of the book (including digital products based on the book) in all languages throughout the world. We look forward to hearing from you and would be happy to answer any queries you might have regarding this request or publication.